Douglas F3D Skyknight (kasneje F-10 Skyknight) je bil ameriški palubni lovec, ki so ga razvili v 1940ih. Bil je eno izmed prvih reaktivnih letal Ameriške mornarice. Uporabljali so ga tudi marinci, v uporabi je bil do leta 1970. 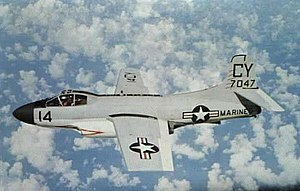 Skynight ni bil tako slaven kot North American F-86 Sabre iz istega obdobja, vendar je bil kljub temu pomembno letalo Korejske vojne. Uporabljal se je tudi kot letalo za elektronsko bojevanje in je bil v tej vlogi predhodnik EA-6A Intruderja ina EA-6B Prowlerja. F3D je tudi vplival na razvoj radarsko vodene rakete AIM-7 Sparrow. ↑ "Standard Aircraft Characteristics F3D-2 'Skyknight'." Naval Historical Centre. Retrieved: 23 June 2007. Badrocke, Mike. "Electronic Warrior". Air Enthusiast, Fifty-one, August to October 1993, pp. 41–48. Stamford, UK: Key Publishing. ISSN 0143-5450. Donald, David (1997). The Encyclopedia of World Aircraft. London: Aerospace Publishing. ISBN 9781856053754. Dorr, Robert F.; Warren Thompson (1994). Korean Air War. St. Paul, Minnesota: Motorbooks International. ISBN 0-879-38862-5. Grossnick, Roy A. and William J. Armstrong. United States Naval , Aviation, 1910–1995. Annapolis, Maryland: Naval Historical Center, 1997. ISBN 0-16-049124-X. Hardy, Michael John. Sea, Sky and Stars: An Illustrated History of Grumman Aircraft. London: Arms & Armour Press, 1987. ISBN 978-0853688327. Heinemann, Edward H. and Rosario Rausa. Ed Heinemann: Combat Aircraft Designer. Annapolis, Maryland: Naval Institute Press, 1980. ISBN 0-87021-797-6. Sullivan, Jim. F9F Panther/Cougar in action. Carrollton, TX: Squadron/Signal Publications, 1982. ISBN 0-89747-127-X. Swanborough, Gordon and Peter M. Bowers. United States Navy Aircraft since 1911. London: Putnam, Second edition, 1976. ISBN 0370-10054-9. GlobalSecurity o "F3D (F-10) Skyknight"